It’s the HTC One X and sadly, it didn’t come with a case. 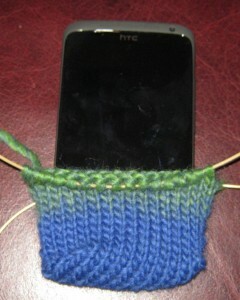 To stop it getting scratched I started knitting a phone sock for it tonight. I’m knitting it on 5mm needles so it shouldn’t take long to finish. The case is more form fitting than it appears in the photo. I may post the pattern here in case anyone wants to knit their own case for the One X. It’s knit in the round on two circular needles and I’m using an odd ball of Wendy Fusion that I had lying around.